August 20 isn’t just National Lemonade Day. 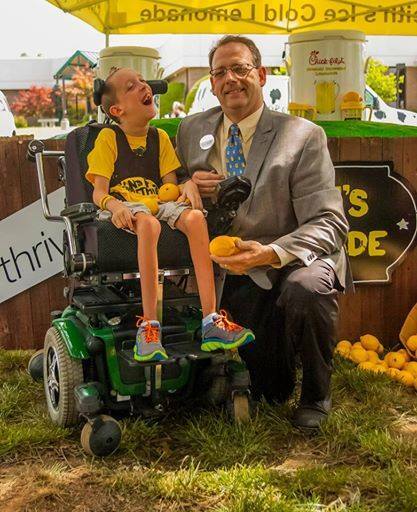 It’s the culmination of a massive fund raising goal, all started by a 10-year-old with a big dream: selling enough lemonade to raise $250,000 for special needs kids like himself. Keith Boyd was diagnosed with cerebral palsy at birth. He can’t run with the other kids. He can’t walk or talk on his own. But he can dream big. And he can draft a business plan for a city-wide fundraiser that has taken the Tulsa area by storm. Driven by his desire to help other children thrive, Keith became an entrepreneur and the CEO of his own company: Keith's Ice Cold Lemonade Stand. It’s a lemonade stand that takes a stand for special needs children. The mission: to improve the quality of life for the children and their families. The Tulsa community, inspired by Keith’s story, is rallying around him to help. His mentors, Chick-fil-A owner and operator Arthur Greeno and Thrive15 CEO and business coach Clay Clark, heard Keith’s story and were compelled to step in and give him the tools he needed to thrive in business. Greeno, who is a board member for the Little Lighthouse, helped to get Chick-fil-A lemonade donated to help Keith’s bottom line. Tulsa-area Chick-fil-A franchises are also feeding volunteers and displaying posters, which all have the message Stand for Something” on them. The Thrive15 team helped Keith secure sponsorships, create a website and execute on the 10 area lemonade stands. Keith’s ultimate goal is to raise $250,000 for the Little Lighthouse, a tuition-free school for special needs children that he attended until age six. It’s at the Little Lighthouse where Keith was given a special device called a Tobii, which enables him to speak. It uses his eyes to type what he wants to say on a screen; the words are verbalized through the computerized device. Keith wants to use the $250,000 in donations to buy hundreds of Tobii devices for students at the Little Lighthouse. August 20 is National Lemonade Day and the last day of Keith’s donation drive, which started June 18. Visit KeithsIceColdBeverages.com to make a donation and for more on Keith’s story.